At Mountain Warehouse they have been developing the very best outdoor clothing, accessories and equipment for all the family since 1997. Today there are over 240 stores across the UK, Europe and North America. From hiking clothing and camping equipment to ski wear and running gear, the store at Westend Shopping Park stock everything you need for your outdoor activities. Most of the products sold are exclusive to Mountain Warehouse, unlike other outdoor clothing shops. By cutting out the middleman they can produce the best quality products at the very best prices. The team pride themselves on providing great value outdoor gear and at Mountain Warehouse you can be sure to receive honest advice and guidance from their knowledgeable in-store retail advisors. Unlike other outdoor retailers, they don’t carry lots of different brands. In fact most of the products they sell in-store are exclusive to Mountain Warehouse and you won’t find them anywhere else. By designing their own top quality products and having them made to their exacting standards, they can control costs and offer incredible value for money. So that means you get the exact same quality, but at significantly lower prices then you’ll find at other shops. Become a discount card member and enjoy savings of up to 70% off marked retail prices, exclusive sale access, special offers and exclusive deals throughout the year and special access to their sale. Joining couldn’t be easier, simply ask a member of the in-store team then register your card online to start enjoying your savings immediately. Visit the expert team in-store and get straightforward advice from their knowledgeable, friendly staff. Did we mention you can also bring your dog too! 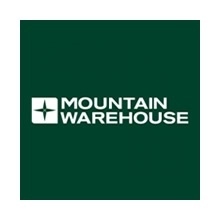 Everything Mountain Warehouse do is focused on serving their customers the best product, the best gear all at the best price.